I love to have something to nibble with my coffee. Most of the cookies, biscuits and cakes in the store here in Finland are too dry and hard to my taste, so I decided to bake something nice and soft. There’s also a heat wave going on here, so I wanted to do something quick and easy that wouldn’t need too much baking, and definitely in not too hot oven. 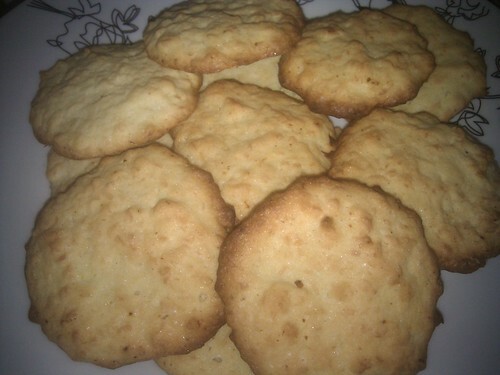 Enter Coconut cookies, or coconut cakes. We baked a cookie similar to this when I was a child with my mum. The recipe called for separating the yolks and whites, and I didn’t want to do that, so I looked for another recipe and found one in a Finnish recipe collection site, Kotikokki.net.